In Canada, there is still much to be recognized in the history books, and even more to teach openly in the classrooms at all levels. Such is the case with the history of leader Louis Riel, who for many people throughout their school years was described as a “rebel” against a very young Canadian government led by Sir John A. MacDonald. There were a lot of facts left out of those lessons, as many people heard by attending the annual Louis Riel Commemoration Ceremony held Nov. 16 at St. Boniface cemetery in Winnipeg. The event commemorated the day Canada hanged Riel for treason. Riel had won a seat in Canada’s government, but was never allowed to sit. Instead a bounty was placed on his head. “It’s an injustice, and it’s a solemn day where we recognize that Canada did the wrong thing,” said Mihychuk. 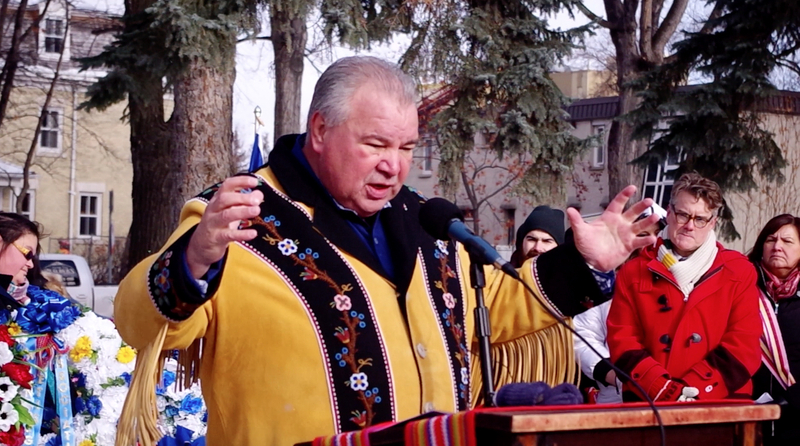 “Riel fought for minority rights” said David Chartrand, president of the Manitoba Metis Federation. The United States even spoke of annexing the territory, said Chartrand. Chartrand objects when Metis people are called “a special interest group. It tells me how far we have yet to go. How can we deal with racial discrimination and racism in a world that still wants to pound upon us that we’re a mixed ancestry of no one. That we can just be assimilated into society and no one will care? “That’s sometimes the mindset of people out there, and it’s sad that it still exists and (these beliefs) are out there in some very powerful people. If we don’t find a way to overcome those, and people don’t speak out, they’re as guilty as those who say it! He asked when will it end?